African violets have a reputation for being touchy plants to care for. This reputation is rather undeserving, in my opinion. If you keep a few key care tips in mind, you’ll have African violet plants that will make even those with the greenest of thumbs envious. Purchase a planter for your African violet that has the watering area at the bottom of the planter. This will usually look like a little outward dip in the saucer area of your planter. Many say they are specifically for African Violets. The reason for this is that you need to avoid allowing your African violet leaves sit in water for any length of time. They are very susceptible to rot. Watering from the bottom is not a total necessity but it does help. In choosing your planter, pick one that is a bit on the small side. 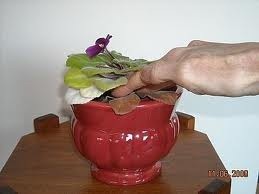 You want your African violet to go about an inch or two over the sides of your planter with it’s outermost leaves. If the plant is not crowded in the pot enough, you will not get blooms. Fill your African violet planter with potting soil sold specifically for African violets. African violets have different nutritional needs from that of other plants. A lot of science went in to designing that African violet potting soil so why not take advantage of it? It also has a lot of styrofoam bits in it. This helps keep the soil more porous so you can avoid having standing water sit up against your African violet roots, which are just as susceptible to rot as the leaves are. Keep an inch or so free of soil when transplanting your African violet. They tend to get top heavy otherwise and your plant can tip on you as it grows. This is one plant that you want to be slightly bound by it’s pot so the main stem will start growing up out of the soil and make the plant go off balance if you don’t have adequate room. Allow your African violet to dry between waterings. You do not want your African violet to be wet all the time. Again, this will cause root rot. Use a slightly damp cloth and gently wipe down the leaves about once a month or so. The point is that African violet leaves are fuzzy. Tons of tiny little hairs to gather up dust, hair and other air pollutants. They can suffocate if this is left on there. Gently wiping them off will allow your plant to breathe and thrive. Snip off any dead leaves or flowers from your African violet plant. You want all the plants growth efforts going to more positive things such as more African violet flowers. Keep your African violet in a location where they get indirect sunlight. Their leaves can burn easily but they do enjoy a bit of sunshine. A room with a sunlight in the ceiling is great for them. My personal African violets seem to really thrive in higher humidity areas such as my bathroom. If you feel your African violet needs another boost after you’ve done all this, you may wish to consider purchasing some fertilizer sticks or miracle grow that is sold specifically for African violets. Date the bottom of your pots. This is interesting when it comes time to transplant to larger pots. I wished I’d written down the year I purchased my African violets as I’ve had them now for about 10 yrs. Do not keep your African violets in a window. The temperatures are not steady enough and the sun beating in can burn the leaves. Don’t move them around often. Find a spot they like and leave them there. They tend to stress more easily than other plants.